Filed to: 2018 hurricane season cant be this bad right?Filed to: 2018 hurricane season cant be this bad right? 2018 hurricane season cant be this bad right? Even before they made landfall, 2017's major hurricanes—Harvey, Maria and Irma—were already causing billions in damage. A new update from the National Oceanic and Atmospheric Administration (NOAA) makes clear just how costly this trio of terrors will end up being, estimating that all three storms clock in among the top 5 most expensive hurricanes to ever hit the U.S. According to the NOAA official list of billion-dollar hurricanes, Harvey tied with 2005's Hurricane Katrina for the most costly on record, coming in with an estimated $125 billion price tag. The damage was largely tied to the storm’s record-setting rains which swamped Houston, the fourth-most populous city in the U.S. Just over five feet of rain fell on the metro area over six days in August, turning the city into a Venetian-looking disaster. More than 300,000 structures and 500,000 cars were drowned in the floodwaters. Scientists have shown that the rains, which were dubbed a 1-in-a-1,000 year event, were driven to such extremes in part by climate change. When adjusted for inflation, Katrina edges Harvey as the most costly storm in U.S. history, but NOAA researchers are still wading through the data to pin down the exact damage total for the storm. The $125 billion number is the best estimate, but the range is anywhere from $90 to $160 billion. NOAA hurricane forecaster Eric Blake told Earther there’s a 10 percent chance Harvey could eventually claim the title of costliest storm with the next official data update coming in April. Coming in at an estimated $90 billion, Maria is the third-most expensive storm in U.S. history, but it holds the dubious distinction of being the most expensive non-mainland storm. Prior to Maria, the most costly non-mainland hurricane was 1998's Georges, which cost a comparatively paltry $3.5 billion. 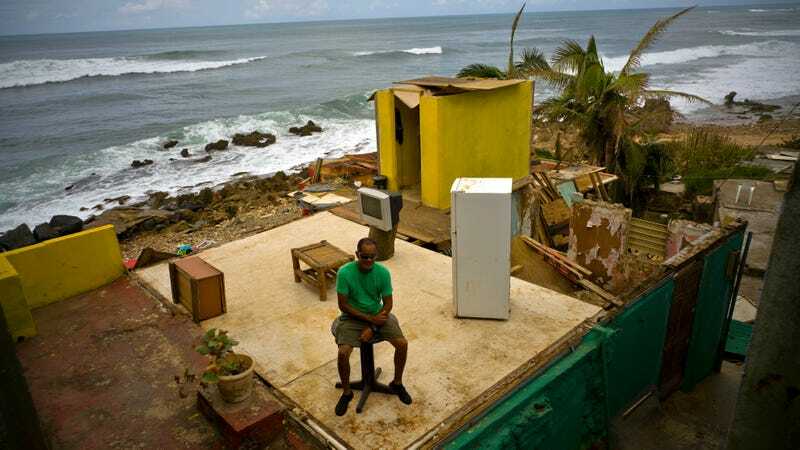 Both Puerto Rico and the U.S. Virgin Islands are still struggling to recover from the storm under the weight of crushing debt, a slow and shady relief response, and struggles to get a firm, equitable plan for long-term recovery in place. Hundreds have already died, there are concerns about a murder surge and unsafe drinking water in some places. Sandwiched between these two storms, it feels like Irma, which clobbered Florida, barely gets mentioned. In almost any other year, it would’ve been the blockbuster storm to remember but it’s almost become a footnote in 2017's terrifying hurricane season. The storm racked up a $50 billion price tag, making it the fifth-most costly storm. The story of 2017 is that climate change coupled with a swelling coastal population a disastrous combination. While hurricane landfall is a crapshoot, the threats associated with hurricanes are definitely changing in a warming world. Extreme rainfall like Harvey’s is becoming more common. Storm surges are getting a devastating lift from sea level rise. The intensity of hurricanes and frequency of the strongest ones like Maria has also increased since the 1980s, a trend expected to continue as the planet warms. Despite the growing risks, people have flocked to the coasts. Nearly 40 percent of Americans lived in coastal counties according to the 2010 census. That number was expected to rise an additional 8 percent by the time 2020 rolls around. The huge costs of these storms—and in the case of Puerto Rico and the Virgin Islands, the overwhelmingly inadequate response—shows that we can barely cope with our currently climate, let alone the the future that awaits us. That means we need to more effectively manage stormwater, build resilient electric grid solutions and even consider the uncomfortable truth that we need to retreat from the coasts before we can no longer keep the ocean at bay.